Nicely done review and interview by fellow scribe Jane Ammeson of the Northwest Indiana Times. You can read it here. 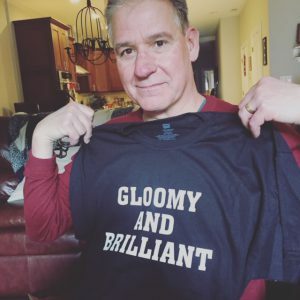 New Review Blurb T-Shirt for BLEAK HARBOR! Courtesy of my wife Pam, my third review blurb T-shirt. Love it. Says it all! Talking with Steve Lauden and Eric Beetner for their Writer Types podcast was a blast. Great questions and insights into BLEAK HARBOR (though I cannot vouch for my answers). You can listen here. As part of my BLEAK HARBOR book tour, I had the pleasure and privilege of sharing a dais with mega-selling thriller author Michael Connelly in Scottsdale, Ariz. More than 200 people–most of them Connelly fans, I’m sure–attended the event hosted by The Poisoned Pen book store. You can watch Mike and I talk about writing and books here.